Aberdeen has been following the adoption of virtualization technologies for many years and as the adoption rate has grown, IT has been able to transform itself from an old “cost center” model to one of being more of a “business partner”. The adoption of virtualization technologies has allowed IT to become more supportive of business objectives and reduce the overall cost of their services, allowing those freed resources to be re-directed to more critical programs. C-Level managers that want more from their IT departments should understand the positive impact of virtualization technologies. This report will explain what virtualization is, and highlight how it is optimizing the performance, both from an IT and business perspective across servers, storage and end user desktops. 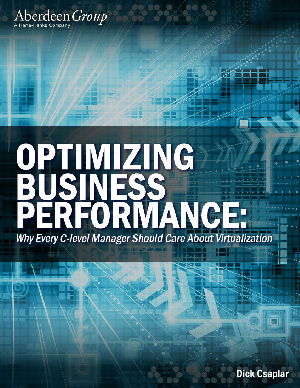 This report will define how top performing companies gain business advantages from virtualization technologies and outline key changes that must take place for C-Level managers to gain the fruits of the new IT.